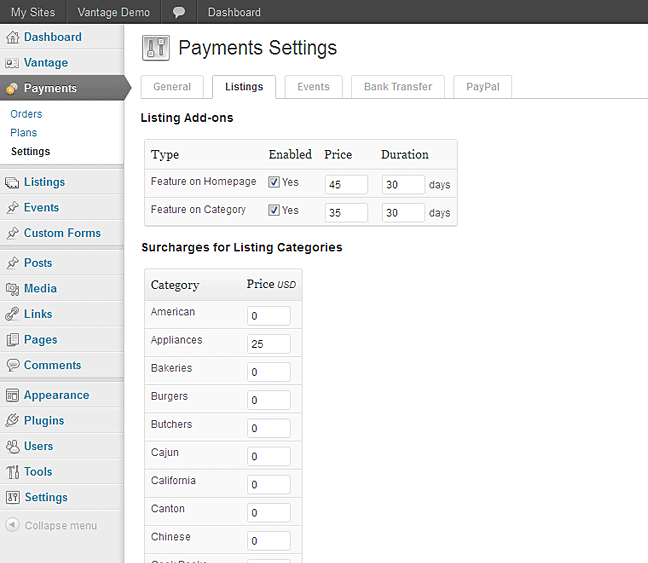 Like most of our application themes, Vantage allows you to charge for listings posted to your site. With pricing plans and lots of listing options, Vantage gives you the power to create the pricing model that works best for you and your customers. In this two part tutorial, we will set up listings settings and payment settings in part one and create pricing plans for listings in part two. We will also present a brief review of payment gateways and how they work with Vantage. Once finished, your site will be ready to take payments from business owners that want to list on your business directory. To begin, you will need Vantage (our WordPress directory theme) – version 1.2 or newer – and WordPress installed on a server. You will also want to read the “Getting Started with Vantage” doc to get ready. Vantage comes with PayPal as the default payment gateway. It’s free to sign up with PayPal and it is accepted in many countries around the world. If possible, we recommend starting with PayPal. You can sign up for an account at the PayPal website. 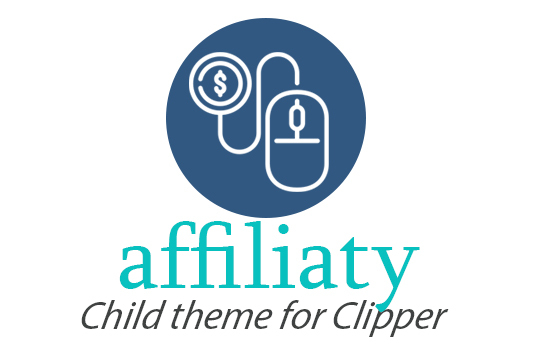 If you prefer not to work with PayPal or cannot get a PayPal account, AppThemes sells plugins for payment gateways in our WordPress Marketplace. You can research and decide which is the best option for you. Once you have Vantage added to WordPress and an account with a payment gateway service, you’re ready to proceed. If you are going to charge for listings, you want to enable this in Vantage. The default setting for this is “on”, but you should go to the listing settings panel to be sure. 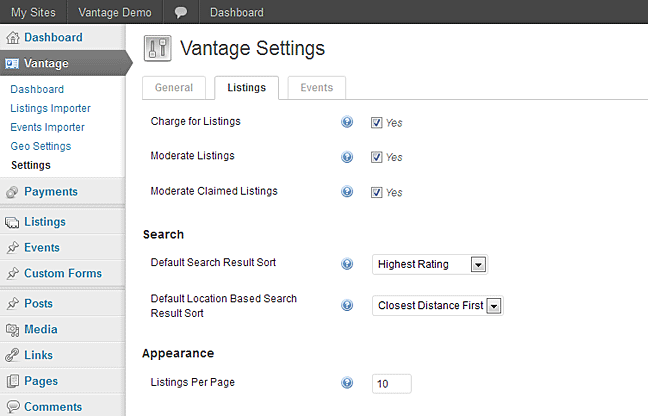 In your WordPress admin, go to Vantage > Settings > Listings tab. You should see the admin panel pictured below. Make sure “Charge for Listings” is checked and click the “Save Changes” button. Vantage will now charge for listings. Pricing is set up elsewhere and we’ll do that in a moment. “Moderate Listings” is an option worth mentioning here. If you want to review all new listings before they are shown to the public, you will want to make sure this option is checked. Leaving this option unchecked means that all new listings will become public immediately after they are created. The choice is up to you. Vantage needs to know a few things about how you will charge for listings on your site. To set up these options, go to Payments > Settings > General tab. You should see something similar to the screenshot below. Important note: when you make any changes on this tab, you should press the “Save Changes” button before you navigate to another tab or page. 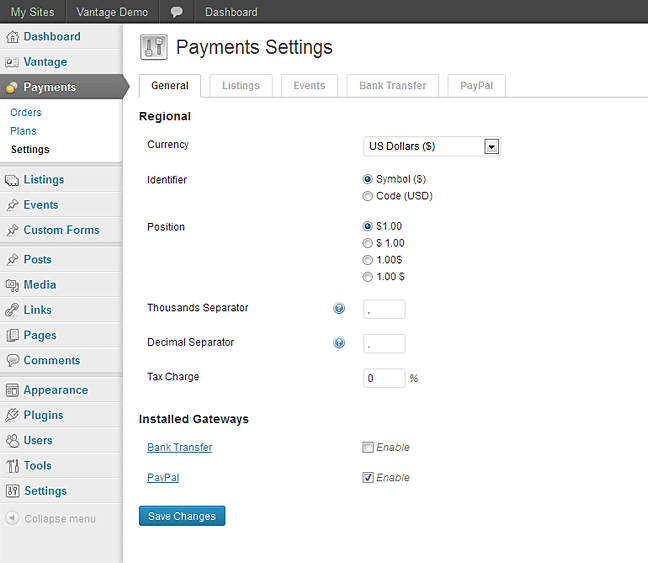 Vantage allows you to choose the currency used to collect payments on your site. At present, you can only have one currency at a time in Vantage. This is the place to choose your currency. Click the drop down next to “Currency Selection” to select your preference. Since PayPal is bundled with Vantage, the default currencies in Vantage are the currencies supported by that payment gateway. If you have added additional payment gateways, you should see additional currency options for the currencies supported by each gateway. The “Identifier” determines how users will view currency identifier in the front-end. You can select “Symbol” to display the currency symbol or “Code” to display the short code for the selected currency. For example, if you have selected your currency to be “US Dollars” and selected “Symbol” as the identifier, the price in your business directory will appear as “$100”. If you select “Code” as your identifier then it will appear as “USD 100”. Controls the position of the currency identifier. Allows you to define a character to be the thousands separator. Most countries use a decimal point or comma (example: 1,000). Decimal separator allows you to define a character to be the fractional currency separator. Usually, a decimal point is considered to be the global decimal separator (example: 1.00). Allows you to apply a tax surcharge to payments. Enter a numeric value in the text box beside “Tax Charge” and Vantage will add that percentage of tax to the total amount. This is where your installation of Vantage may differ from the screenshot above. Vantage will list, in this section, all of the installed payment gateways. If you have added more gateways, you will see them listed with “PayPal” and “bank transfer” (note: bank transfer not available in Vantage 1.1 but coming soon). To enable a payment gateway, simply check the “Enable” box to the right of that gateway. If you choose multiple payment gateways, Vantage will allow your customers a single choice from the gateways you have enabled (see example). With more than one enabled, you give your customers the ability to determine the gateway that works best for them. Now that you have configured General Payment settings, we will now walk you through the Additional Payments settings for Listings. 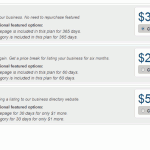 You can set up these options to generate more revenue from your Business Directory. To set up these options go to Payments > Settings > Listings tab. This section primarily deals with settings for featured listings. 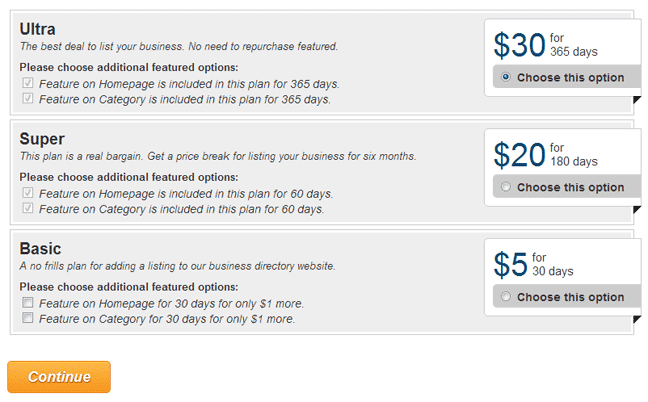 You will have additional options for featured listings in pricing plans, but these are the base options. Here, you can set the price and duration for listings featured on the home page and listings featured in a category. Duration determines the length of time that a listing is a featured listing. Duration is calculated in days. 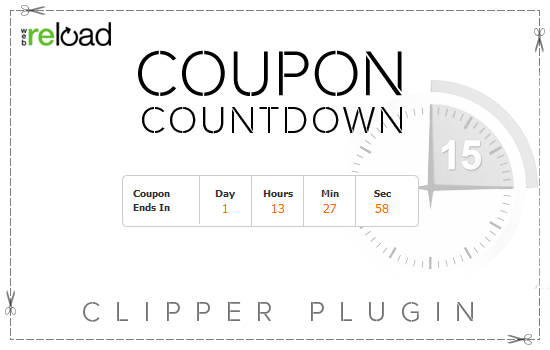 Enter the number of days you want the featured status on a listing to last. If you do not want featured status to expire, enter zero. Price is the amount you want to charge for a featured listing. Vantage only allows whole number values. For example, 12 is allowed but 12.99 or 12,99 are not allowed. It’s important to keep in mind that a listing’s featured status could expire before the listing itself expires. When that happens, the listing owner can renew the featured status of their listing without needing to renew the listing. When renewing featured status, the amount charged and the duration of the featured status are determined by the settings here. When you have made all your preferred changes in the General tab of the payments settings section, click the “Save Changes” button implement your new settings. Vantage allows you to add a surcharge for listing a business in certain categories. For example, if you wish to charge $2 extra for posting in the “Restaurant” category, then you can enter “2” in the text box beside “Restaurant”. 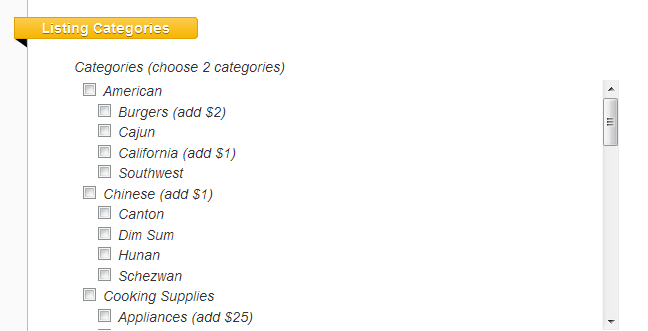 The category surcharge is added to the listing charge. Category surcharges are additive. If a customer chooses two categories with surcharges, they pay the listing price and both surcharges. The image below shows how surcharges will look in the “Create a Listing page” in the front-end. You will notice in the payments settings section of the WordPress admin that there is a tab for each installed gateway. You can click each tab to see the settings for that gateway. Each payment gateway will have it’s own settings and options. You can follow the directions listed on the page or find instruction or tutorials elsewhere on our site. Since PayPal is the default gateway for Vantage, we’ll take a look at those options and how to set them up. As mentioned before, you will need a PayPal account in order to use PayPal as your payment gateway. You can create an account at the PayPal website. PayPal Email – Add the email address used with your PayPal account here. Make sure it is entered correctly. If it is not exact, PayPal will not process your payments. 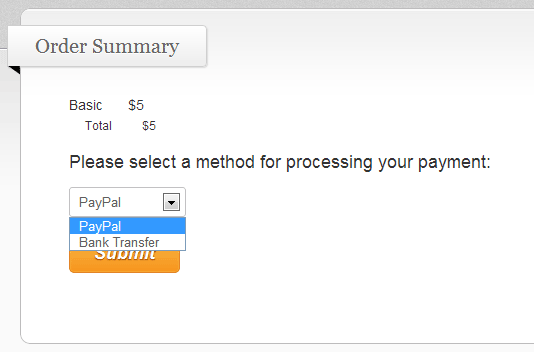 PayPal Sandbox – The sand box feature allows you to test payments with your PayPal account. You can read all about PayPal sandbox here. Enable PDT – PDT provides an extra layer of security to payment transactions on your site. AppThemes highly recommends that PDT is enabled for your site. To find out how to add PDT to your site, read our tutorial Enable PayPal PDT (Payment Data Transfer). Once you have added your payment gateway details, make sure to click the “Save Changes” button before moving on. Now that you have edited the listings and payments settings on your site, you’re ready to create pricing plans. Part two of this tutorial will show you how to create pricing plans for Vantage.